On this day in history, February 7, 1783, the Great Siege of Gibraltar is lifted after peace agreements are signed ending the American Revolution. The Great Siege of Gibraltar was a combined Spanish and French effort to take Gibraltar back from Britain. The entrance of France and Spain into the war on the American side stretched British forces thinly across much of the world as they tried to protect their interests in multiple locations. Spain and France agreed to help each other take back territories lost to Britain in earlier battles. 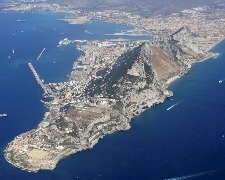 In particular, France agreed to help Spain take back the peninsula of Gibraltar in the south of Spain, which the British had owned since 1713. Gibraltar is critical to the movement of ships from the Mediterranean to the Atlantic. It is only 2.6 square miles large, but it has been fought over for centuries because of its location. The main feature of Gibraltar is a 1,400 foot high mountain known as the Rock of Gibraltar. The territory shares a small border with Spain on the north end that is only .75 miles long. The Great Siege of Gibraltar began on June 24, 1779 and would last 3 years and 7 months. 5,300 British soldiers were stationed there. A force of 13,000 Spanish forces camped on the north end of the peninsula, while a fleet of Spanish and French ships blocked the island from receiving reinforcements. By the winter, food was running low, but a British fleet was able to penetrate the blockade. In fact, several times over the course of the siege, British fleets were able to break the blockade and bring in vital supplies and reinforcements. On September 13, 1782, nearly a year after the surrender of Cornwallis at Yorktown, the Spanish and French mounted their largest attack. 5,000 soldiers manned "floating batteries" armed with cannons, 30,000 sailors manned 78 ships, while 35,000 troops amassed to storm the British fortifications. 80,000 civilians watched from nearby hills across the border in Spain, expecting to see their armies victorious over the British. The ships bombarded the British positions, but the British bombarded them back, causing great damage to the fleet and the floating batteries. After several weeks of little progress, another British fleet showed up under the command of Admiral Sir Richard Howe, the same Admiral who had been in charge of the British fleet in North America earlier in the war. 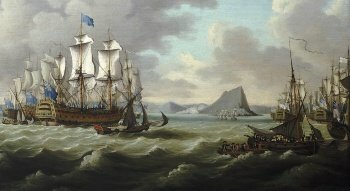 A strong gale on October 10th blew the Spanish and French fleets off, allowing Howe's 65 ships in to the peninsula with food, supplies and ammunition. Howe's fleet left and the siege continued for several months more. The preliminary Treaty of Paris that would end the American Revolution was signed on November, 30, 1782. Parliament ratified the Treaty in January, 1783 and Congress ratified it in April. Spain and France ended the Siege of Gibraltar on February 7. In the terms of the Treaty, Britain was allowed to keep Gibraltar. Nearly a half million bullets were fired during the conflict and the British used up 8,000 barrels of gunpowder. Over 1,200 British soldiers were killed or wounded and 6,000 British and French were killed or wounded in the largest and longest action of the war.